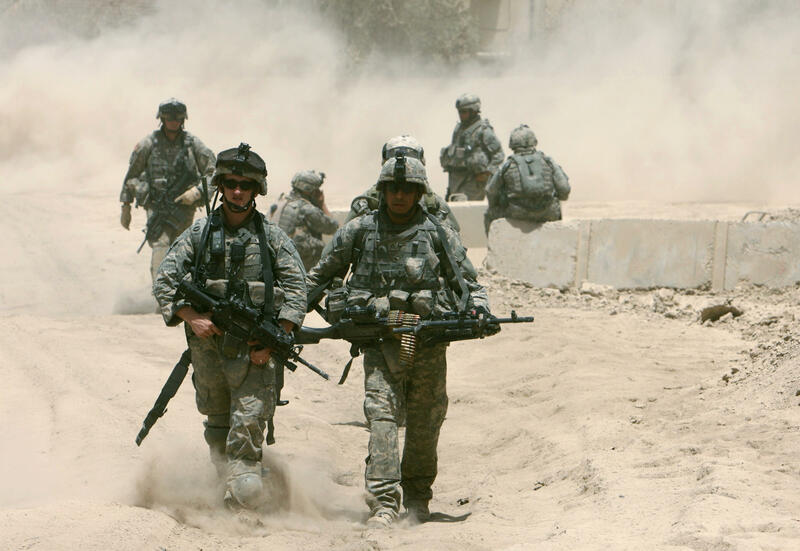 US soldiers walk through dust in front of their base after a patrol in Baquba June 26, 2007. Lawrence Davidson, a veteran of the Iraq War, and Yaroub Al-Obaidi, admitted to the United States as a refugee, both left Iraq in 2007 and today, both live in greater Philadelphia. The two took part in a project earlier this year that invited members of both communities to share their memories of Iraq. Al-Obaidi was among the Iraqis who hoped that the American invasion would bring positive changes to Iraq. A graduate student in art, he hoped Iraqis would have greater freedom of expression and that the economy would improve. While his university in Baghdad suffered heavy damage, he found things changed for the better in the early years of the war, 2003 to 2004. Davidson served as an engineer in the Diyala province of Iraq from August 2006 through November 2007. “You can say anything you want. You can do anything you want, but after this people start to lo[se] their life, maybe [in] a car bombing. So many people, so many friends, they lost their lives because of this,” Al-Obaidi recalls. In Al-Obaidi’s hometown of Diyala, interaction with US soldiers became a predictable part of daily life. An American roadblock controlled traffic on a bridge between his home and the nearest shopping area. By 2007, the situation had become much more dangerous. Al-Obaidi had completed his master’s degree and worked teaching art to university students. This attracted unwelcome attention from an Islamist militia. “They came to look after me in my home, some people with weapons,” when his mother was home alone, he said. He stayed in his aunt’s home long enough to get the papers he needed to travel and left the country, initially for Syria, which was stable at the time. Artist Michael Rakowitz organized the project, known as Radio Silence, that brought Davidson and Al-Obaidi together. He produced a performance and podcast convening two groups that rarely interacted in the United States. Participation, he noted, involved self-selection. Among those who chose not to participate, one had been unable to get his injured child through an American checkpoint to take him to the hospital after an attack. During the course of the project, Rakowitz met separately with both groups and brought them together for a dinner at Philadelphia’s only Iraqi restaurant. “I was curious. I was nervous,” Davidson said, about what would be his first interaction with Iraqi refugees in the US. Al-Obaidi said he understood their nervousness, though, speaking for himself, he said he felt no hostility. “Some of them maybe because it is first touch, first time they speak to us, maybe they have opinion we are of close mind,” he said. But he believes, personally, that American soldiers just did their job in Iraq, and were not individually responsible for what has ensued. For Davidson, who now works full-time providing veteran services, the dinner and the project overall have begun a conversation between the two communities — one he hoped would continue. “When I talk to veterans and work [with] veterans, I find that they can stop thinking the large car bang outside is the bomb — but to reconcile what they were a part of, or what they individually did or what we all did as Americans, that is much more difficult,” he noted. “I think that that moral injury, if we're ever going to get to a point where we have a way to heal it, it's going to be across difficult, uncomfortable conversations."